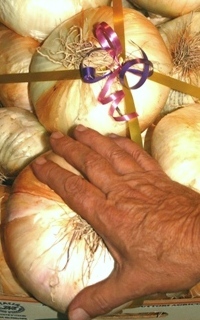 The first time anyone asked me if I wanted a crate of onions gift-wrapped was at the Festa della Cipolla, the Onion Festival in Giarratana, Sicily. Giving onions as a gift may not seem like a normal practice, but these are no ordinary onions. These are the huge disk-shaped onions of Giarratana, weighing up to 2 kg (5 lbs) apiece, their thick white flesh sweet enough to be eaten raw. This is the only place they grow in Italy, and after the seedlings are planted during a full moon in later winter, close to a million kilos of onions are harvested by hand in July and August. When anointed with olive oil and slow-roasted, their juices become as brown and sweet as caramel, and with a hunk of crusty bread make a fine lunch. We forego the gift wrap, as we plan to eat these 10 kilos ourselves. Every summer we make our annual pilgrimage to the small town of Giarratana, located about 20 kilometers inland from Ragusa in southeastern Sicily, and celebrate the harvest of this noble onion by eating focaccia stuffed with onions, tasting cheeses with onion jam, feasting on panini of sausage and grilled onions, and generally getting indigestion. Vendors with truckloads of onions line the streets, with the biggest onions, roughly the size of Frisbees, prominently displayed. Overhead there are multicolored lights strung in elaborate decorations – after all, a festa requires festiveness – and noisy Italian families pack the streets, with small children riding on their father’s shoulders getting the best view in town. Stands selling locally produced cheeses and almond torrone, are mixed in with bright balloons and cheap shiny toys that are made in China and will break before the festa is done. A live band is warming up, and blasts of Italian rock are interspersed with the squeal of feedback and an amplified voice repeating “Uno-Due-Tre, Uno-Due-Tre.” Everything is cloaked in thick smoke from the food stands, and the smell of grilling sausages and onions permeates the warm summer night. We munch oily onion focaccia as we peruse the food stands to see who has the best looking sausages, and settle on a stand where they are taking the time to grill the bread, which makes an infinitely better sausage panino. I wait in line while Emanuele goes off to score some wine, and as I get closer to the grill I notice that there are also strips of raw meat piled in a plastic tub. I crane my neck to get a better look to see if it is something I might want to taste, when I hear the woman in front of me order 14 panini. My stomach groans in hungry anguish. When it’s finally my turn, I stick with the sausage. With extra onions, please. Read about how to cook onions with these Italian onion recipes. Details: The annual Festa della Cipolla is held in Giarratana, Sicily on August 14, starting at 6.00 pm. You will need a car to get there. Stay in Ragusa, at the simple 3-star Hotel Il Barocco in Ragusa Ibla, or the newly opened 5-star Antica Badia Relais in upper Ragusa, both about 20 km away. I do not think I will ever be in Sicilia in August and I have yet to see these onions in Noto. Where could I find them? I will send you a box, though probably not gift wrapped. Sometimes you will find these onions into the month of September, though rumor has it that some are grown in Comiso, so don’t taste the same. Giarratana dirt is Giarratana dirt! Pingback: Cipolle di Giarratana- Huge sweet onions from Sicily are delicious roasted, baked or grilled. Ciao Bella – glad you enjoyed this post! Ti ho scritto piu di un mese fa per domandarti se era possibile di avere le semente delle cipolle di Giarratana, sei stato molto gentile di rispondere a dirme nel mese di Agosto quando le trovi me lo fai sapere,,fino oggi non ricevuto niente,, Lai trovati? Grazie e ciao Giovanni.